There are endless combinations of things that can go into, on, or around a burger to change its flavor and make it unique. There are stuffed burgers, burgers topped with eggs and bacon, and even burgers with grilled cheese sandwiches as a bun! It seems like the world has gotten caught up in the endless ways to add flavor to a burger and for the at home chef, this can be intimidating. The key to making a unique burger is really pretty simple though: know your roots. By knowing how to make a perfect simple burger, you can easily add complexity and impress your guests! The Meat: I recommend using an 80/20 ground chuck to start. The 20% of fat in the meat is going to make your burger really juicy and add great flavor! The Seasoning: Place the ground chuck in a large bowl and season generously with salt and pepper. You can add any other seasonings you like at this stage, but be careful if you’re adding liquids, too much and your burger will fall apart. The Size: It’s important to make a nice round patty. If you make the burger too thin it will dry out quickly on the grill. If it’s too thick the outside will char and leave the center raw. 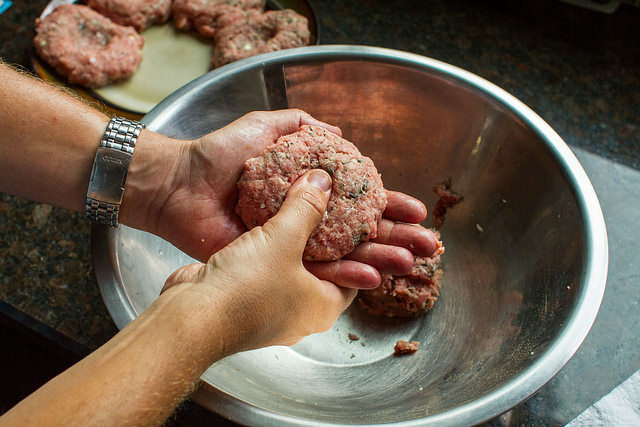 Use the Weber burger press to make sure your patties are the perfect size and shape. The Dimple: Push your thumb into the center of the patty to create a dimple. This will keep the burger from puffing up and becoming a meatball on the grill! The Flip: Create great sear marks by flipping your burger only once through the entire grilling process. Not only will this help make great sear marks but it improves the flavor by keeping the lid closed. To grill the masterpiece you’ve created, simply preheat your grill for 15 minutes, brush the grates clean, and grill the patties over direct medium-high heat (450°-500° F), for 8-10 minutes (160° for medium), turning once. In the last minute of cooking time, add cheese to the patties and toast the buns over direct heat. Now that you know the basic breakdown of the perfect burger, get creative! Try different spices, buns, toppings and cheese combinations. Before you know it you’ll be creating your own signature burger! Have fun and remember to share your creations with us by tagging them #webergrills! For more burger inspiration check out other ideas here, here and here!